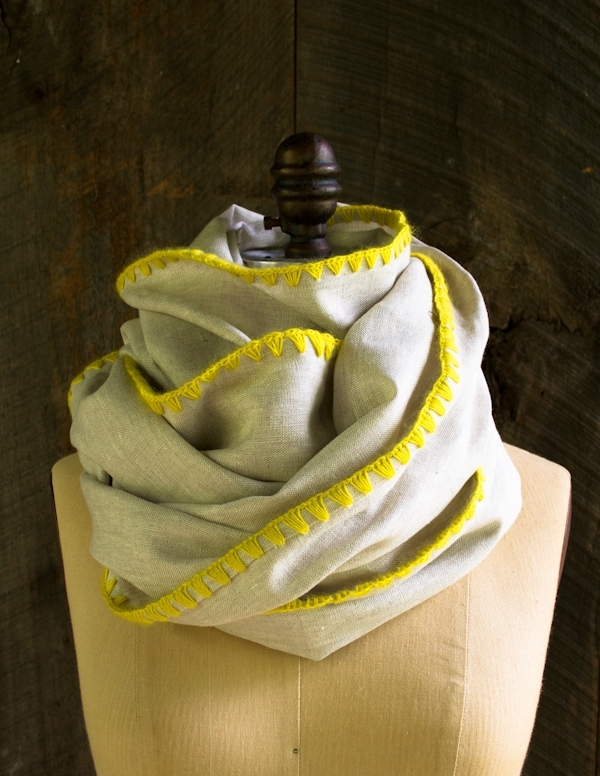 With a single hook in one hand and the softest of yarns flowing through the fingers of my other hand, a rhythm takes over, and in no time, a simple hemmed rectangle has totally transformed into a gorgeous wrap, seemingly with no effort at all. 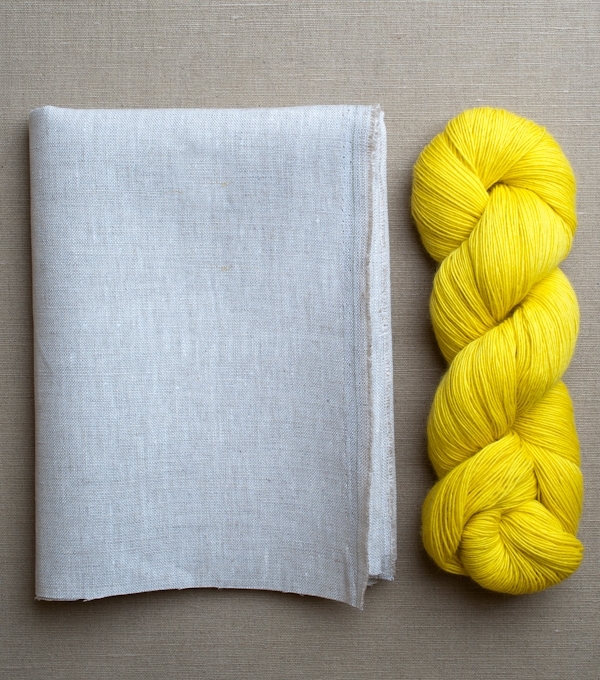 I outlined Robert Kaufman’s crisp Waterford Linen with Purl Soho’s merino beauty, Line Weight. 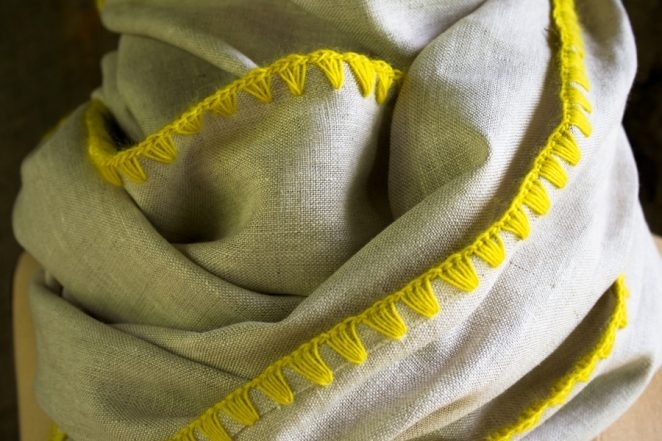 Its brilliant color and graphic stitches highlight the natural hand and drape of the Waterford Linen, softening its edge with the wool’s subtle bloom. 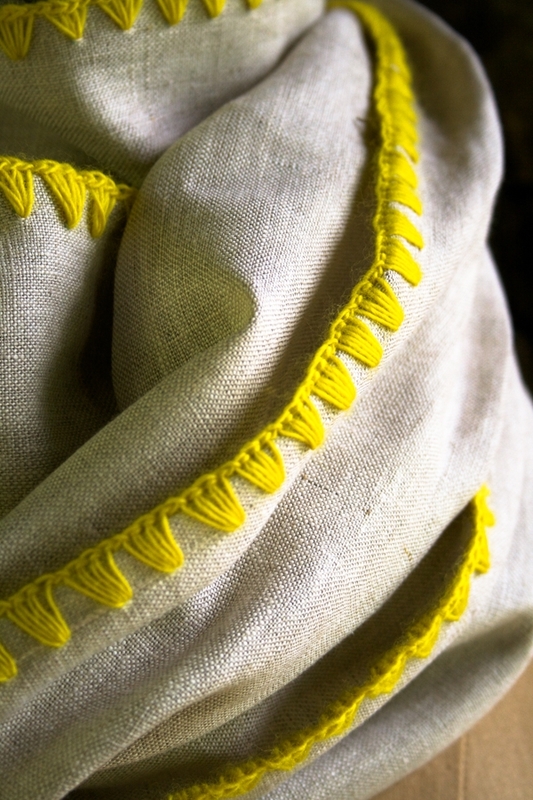 2 yards of Robert Kaufman’s Waterford Linen. I used the color Natural. 1 skein of Purl Soho’s Line Weight, 100% merino wool. I used the color Yellow Yellow. Gutermann’s Cotton Thread. I used the color 1040. NOTE: This is enough fabric and yarn to make two wraps! 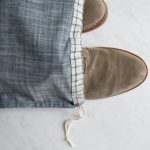 For a a step-by-step photo tutorial of the techniques used in this pattern, please see our Flannel Receiving Blankets pattern by clicking here. Cut the fabric lengthwise along the fabric’s fold into two 27-inch by 72-inch rectangles. You will use only one of the rectangles; save the other for another use (like another wrap!). Wind the yarn into a ball. Place it to the side for now. 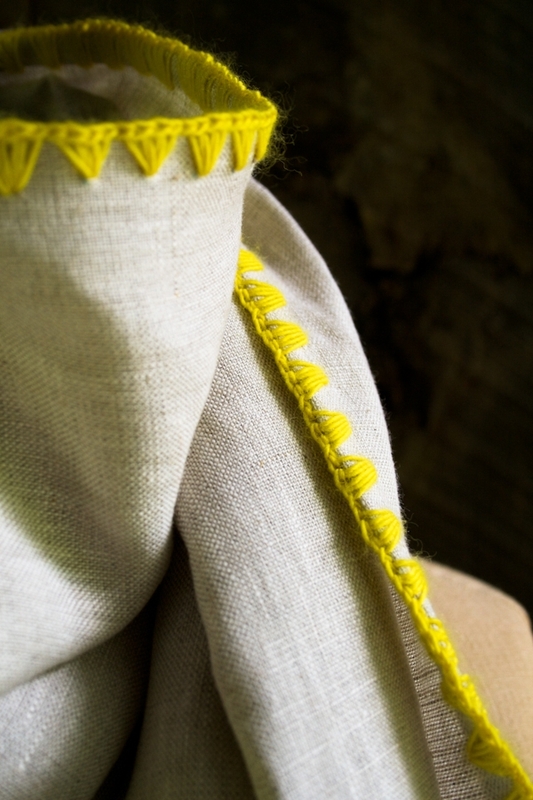 Fold and press each edge of the fabric ¼ inch toward the wrong side. Fold and press each edge ¼ inch toward the wrong side once more. Pin the folds in place and sew down with an edgestitch. Note: You will be piercing the fabric approximately every ½ inch. You can mark the fabric using a Chaco Marker if you would like a guide or you can just eye-ball it. Orient the fabric so the right side is facing you. 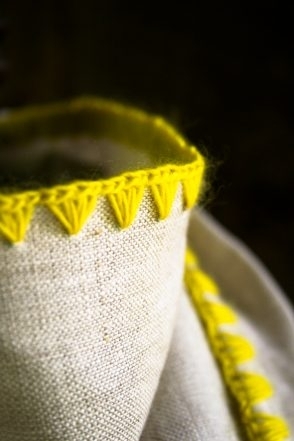 Beginning approximately 1 inch from a corner, insert hook just below the hemmed edge. Pull a loop through. Grab the yarn from the back and pull it through the loop you just made. 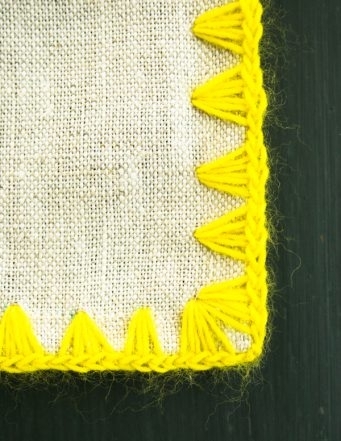 Insert hook back through the same hole, and make a single crochet along the edge of the fabric. Insert hook approximately 1/2 inch from the previous hole, and make a single crochet. Insert hook through the same hole, for a third time. Make a single crochet. Repeat from * until you reach the corner. After you’ve made the cluster of single crochets right before the corner, chain 3 (rather than 1). For the next stitch (the first of the new side) insert the hook into the last hole you made. Continue around the 2nd, 3rd and 4th edges of the wrap, turning each corner as described, until you reach the hole where you first began. Insert hook into the first hole, where you began, and make a single crochet. Cut yarn and pull it through. Using a tapestry needle, weave in the ends. I love this – what a great way to mix several materials and skills. Do you think it would work as a narrow scarf (say 12" to 13")? This calls for a video tutorial! We don't have a video on this but there are photos and further explanations on the flannel receiving blankets project linked in the project. 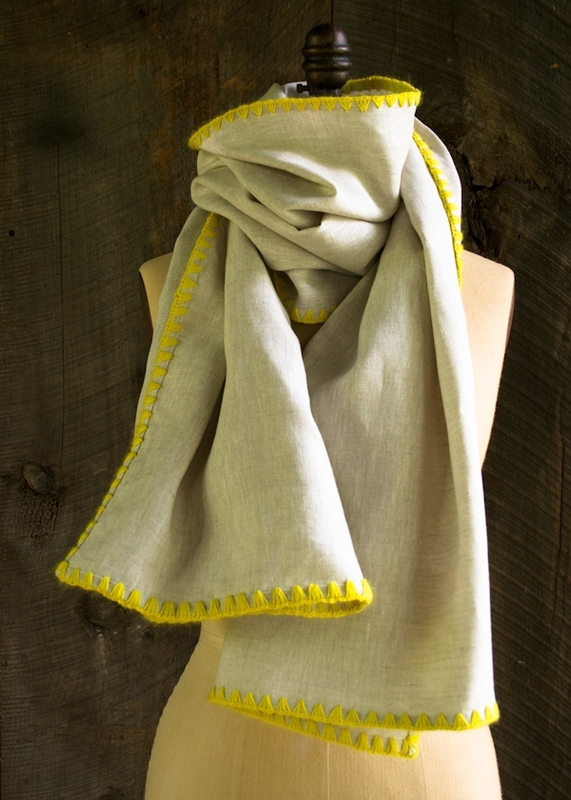 Yes, we think that this technique would work great at a narrow scarf. It basically works for any width or shape! Check out hook chart at http://www.karpstyles.com/crochet/hook-chart.html, the steel hooks are classified by numbers. I am guessing a size 1 or 2 hook, approx. 2mm. would get you the gauge you need. Size A crochet hook converts to a 2mm. Other people have used Size B for this project and it has worked successfully. I would use whatever the smallest size hook you have that you can still grab the yarn with. The smaller the hook, the smaller the puncture point. Laura, To photograph your delicate handwork so close shows courage to me. Thank you for sharing all your work. Your craftsmanship is inspiring! 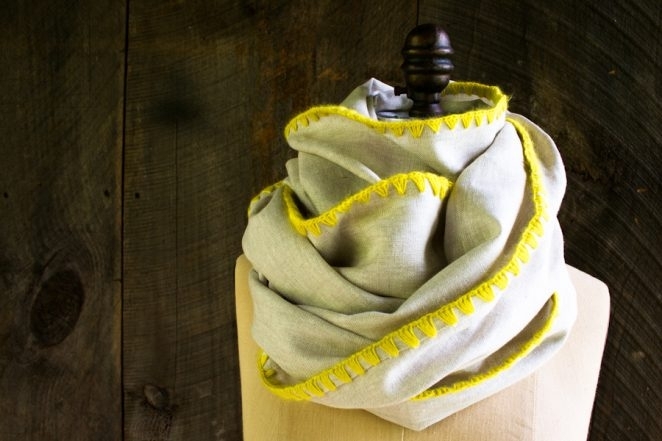 Hi – this is a beautiful project and I've ordered the linen and yarn to make it for a dear friend who is going to a weding this summer in Europe! 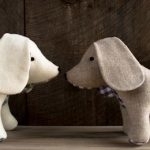 My question is – should I wash the linen before I begin the sewing/crocheting? Thanks very much for your lovely and inspiring work! You can wash the linen before hand. This will help prevent any warping that may occur in the wrap's first wash.
Do you know approximately how many yards yarn were used? Less than 1/2 a skein was used. I would estimate 200 yards. I LOVE this, but really, really need a 30 second video demo. Thanks for writing in. I’m so glad you like the pattern. 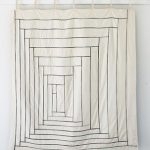 If you take a look at the NOTES section, there is a link to the Receiving Blankets project which has all the how-to images I think you’re looking for. I’ve also put the link below as well. Thanks again for your excitement over the project. Hope you enjoy it! Let me know if you have any other questions. I just made the linen part and will begin crocheting on my plane ride tonight! Love the pattern! I keep scrunching the edge whenever I crochet. I tried making each stitch looser, but the fabric keeps squishing. Any tips to keep the fabric straight when crocheting the edge? Thanks for writing in! If you are a tight crocheter (I definitely am! 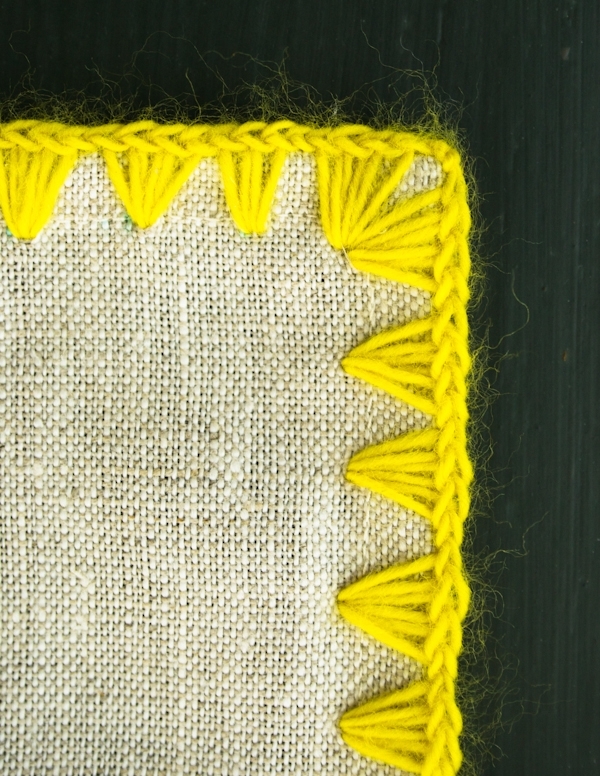 ), you may need to move up a hook size to further loosen your stitches. 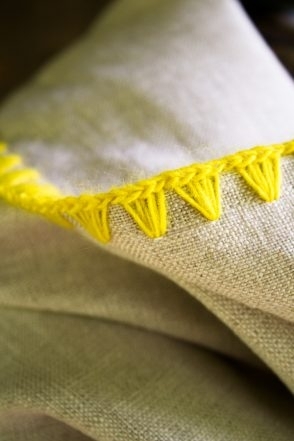 Since going up more than one hook size would make it difficult to push through the linen, if that still doesn’t solve the problem, you could try either spacing your clusters a bit closer together or working clusters of four single crochets instead of three. I would try both options on a scrap piece of fabric to see which one works better for you! I agree a video tutorial is needed. My Grandmother showed me how to do this edgework. Of course, I have forgotten how to do it, and my Grandma has since passed away. My daughter is now expecting, and, I want to carry on the tradition. Can you please help? I’m running out of time as she is due Sept. 10th, 2018. Thanks very much. Thank you for reaching out and congratulations on your grand child! Your suggestion for a video tutorial is a great one and I will certainly pass it along. Unfortunately we do not currently have the resources to make it happen, so In the mean time we do have a step by step photo tutorial that I find very helpful.